In May, Belarusian disability rights activists held a “Week of Accessibility.” According to the organisers, without the creation of an accessible infrastructure for disabled people it is not possible to talk about true equality in Belarusian society. Belarus remains the only country in Europe that has not acceded to the UN Convention on the Rights of Persons with Disabilities. People with disabilities remain marginalised in Belarus. A significant portion of people with disabilities rarely leave their apartments and have no opportunity to study or work. Disabled people have to deal with both physical and regulatory barriers. The main blame for this lies with the state authorities and a society that still retains the stereotypes about the people with disabilities. However, people with disabilities themselves take matters into their own hands and fight for their rights more and more often. Today they require the solidarity of Belarusians and the international community to achieve the accession of Belarus to the UN Convention. More than 512,000 people with disabilities live in Belarus. Among them, 20,000 use wheelchairs. Moreover, the annual incidence of disability increases by around 50,000. Every twentieth Belarusian is disabled, but society seems not to notice this problem. The absence of adequate infrastructure leads to all-to-familiar stories where people with disabilities rarely leave their flats. According to the estimates of wheelchair users, 9 out of 10 people with a physical disability cannot leave their houses independently. Belarus is slowly creating the necessary conditions for the disabled in the form of ramps or low-floor buses. However, the majority of public and private institutions remain inaccessible to wheelchair users. A few years ago, the coordinator of the Office for the Rights of People with Disabilities Sergey Drozdovsky, while visiting the theatre in Minsk, told the guard that the theatre remains inaccessible to people with disabilities even after the latest renovation. In response, the guards of the theatre kicked him out of the theatre. In addition to the absence of the needed infrastructure to help them get around, the disabled in Belarus face other issues with getting an education and securing work. The state has created enough secondary schools for the disabled. People with disabilities can study in specialised classes, special schools and even boarding schools, but often their infrastructure remains inadequate to meet the needs of the disabled. It should also be noted that there is not one high school in the country prepared to teach pupils that have a variety of disabilities. Only 14% of Belarusian disabled people of working age have a job. While the majority of disabled people are working in positions that require minimal qualifications with low wages. Also, companies often officially hire disabled people to work for them, but do not actually provide them with any actual work after they are hired. This phenomenon is the result of the Belarusian authorities introduction of tax incentives for enterprises in which 50% of workers are disabled. Thus, the firms use disabled people for their own purposes. Meanwhile, the skills of the people with disabilities continue to decline. Belarus does not seem like a unique country that has a problem with discrimination against the disabled. Even well developed countries are often unable to provide equal opportunities for people with disabilities. However, the situation for people with disabilities in Belarus remains different for several reasons. Belarusian authorities still have not introduced any anti-discrimination legislation and some laws violate the rights of the disabled. Consider the fact that people with significant disabilities cannot adopt children. On the other hand, the same people have no right to go through the border without waiting in line. If disabled Belarusians live in nursing homes for retirees, they have no guarantee that they can leave them or while they are there, to be able to use their own money freely. Instead of really addressing these issues, the authorities take half measures. For example, the Minsk Automobile Plant (MAZ) began to produce low-floor buses, but often people with disabilities cannot get into them. Curbs remain unprepared to accommodate the disabled, and the drivers are not allowed to go out and help a disabled person to get into the bus. Local authorities build ramps, but they often do not meet the appropriate standards. Poverty also remains a significant factor influencing the lives of the disabled. The state does not have the necessary funds to provide appropriate conditions for disabled persons at universities or health centres. Social support payments to the disabled remain very small. For example, wheelchair users in Belarus monthly receive about € 100. Despite the fact that Belarusian society remains concerned about the state of the disabled people in Belarus, it retains significant stereotypes. 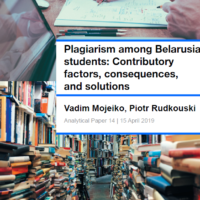 According to the Independent Institute of Socio-Economic and Political Studies only a third of Belarusians support the idea that his child could study in the same class with disabled children. Only a quarter of Belarusians think that the state should create conditions so that people with disabilities could work equally with everyone. Others believe that the state should increase benefits and social payments to the disabled so that they did not have to earn a living. Still others believe that the state should create specialised enterprises for the employment of people with disabilities. Belarus has not acceded to the UN Convention on the Rights of Persons with Disabilities, though it has complied with all the formal requirements. Sergey Drozdovsky, coordinator of the Office of the Rights of Persons with Disabilities said that today, “we need only the political will and the raised hand of one deputy who would put the question of accession to the Convention on the agenda.” The authorities refrain from acceding for one reason. The Convention binds the state, making it fulfil its obligations under the UN Convention. Western aid has been of great importance to Belarusian people with disabilities. For example, the U.S. Agency for International Development promotes inclusive education for people with disabilities. The main purpose of the USAID programme is to create the necessary infrastructure – ramps and doors, that have been adopted to the needs of people with disabilities. Also as part of this program experts develop a joint study programme for children and those children with disabilities. However, disabled persons are creating hope all on their own. People with disabilities unite together and form organisations, hold protests and create their own special maps, where they mark the places that are accessible for the people with disabilities. Self-organisation remains the only viable way to fight for their rights. During the “Week of Accessibility” disability rights activists held many public lectures and free legal consultations to help people with disabilities to preserve and utilise their rights. The disability rights movement remains an important part of civil society in Belarus. The West should help it not only financially, but also facilitate and encourage Belarus’s accession to the UN Convention on the Rights of Persons with Disabilities. Strikes of entrepreneurs in Belarus dominated the public opinion over the last days. How the authorities reacted to the protests?Budzma`s ADNAK attracted a large crowd with its innovative award ceremony. The Council of Europe together with Belarusian authorities organised a round table on death penalty. Treci Sektar, a Belarusian NGO, decided to do something for Belarusian men and launched the Mens Club as a platform for public discussion. Entrepreneurs strike in Belarus. About 70% of entrepreneurs in markets and shopping centres of Belarus did not come to work in Minsk and regions in the day of the strike on 27 June informed the analytical centre of the Republican Confederation of Entrepreneurship. Entrepreneurs held a one-day strike against the introduction the technical regulations of the Customs Union "On the safety of products of light industry." The entrepreneurs protest got wide coverage in both independent and state media. On the same day one of the strike organisers, the leader of "Perspectiva" NGO Anatoly Shumchanka was detained and sentenced for 5 days of administrative arrest. Liability for illegal polls affirmed in law. The House of Representatives of the National Assembly of Belarus adopted the amendments to the Code of Administrative Offences and Procedural Code of Administrative Offences. Among others, the new law provides liability for illegal conducting polls (Article 9.28). Lawyer Yuri Chausov believes that the law may enter into force as early as this summer. Against the death penalty in Belarus. On 21 June the House of Charity in Minsk hosted a roundtable "Religion and the death penalty". Most participants, including the Metropolitan Filaret, spoke out against retaining the death penalty in Belarus. The event was organised by the Council of Europe in cooperation with the Belarusian authorities. The round table was attended by representatives of the churches, Belarusian officials, delegates of the Council of Europe, diplomats and human rights activists. Eco Forum cancelled. Scheduled on 28-30 in Polotsk, Eco Forum of CSOs was cancelled in two days before the opening and postponed till the fall. The reason is that authorities denied providing a venue for the event, as well as the hotel referred to technical problems. About 100 participants among them representatives of Belarusian environmental CSOs, foreign experts and the media were registered to participate in the Forum. Public Council without public organisations. 21 people have become members of the recently established Public Council under the Ministry of Internal Affairs, whose first meeting takes place on 28 June. All members are representatives of arts, culture, religion, law, industry, sports, the media, and parliamentarians. The Council, however, does not include any representative of CSOs. Attorney returned her license. Minsk attorney Tamara Garayeva, whose license was revoked after she refused to defend Irina Khalip, reportedly was reinstated as a licensed advocate. According to the Belarus Ministry of Justice, she followed the procedure and applied for reinstatement of her license after 3 years of its revocation. According to the Ministry representative, none of the other eight disbarred lawyers applied for a reinstatement of their license, “because they found better-paying jobs”. State-run radio provides space for CSO leader. On 29 June the First National Channel of Belarusian Radio holds an online conference with the Chairman of the Presidium of the Republican Confederation of Entrepreneurship, Vladimir Karyagin. The topic of the online event is "Business development in Belarus." Social Weekend competition. On June 20, online charity platform "MaeSens" launched a competition for social projects Social Weekend. The organizers invite others to take part in the competition of projects which propose a solution to social problems. Participants will have an opportunity to get an expert opinion from a competent jury, find an investor for the project, as well as to win grants in the amount of $ 1,000, $ 700 and $ 500 dollars and create their own fundraising page on the platform MaeSens.by. 34mag launches "Bicycle" project. An interactive map for cyclists that covers all of Belarus and answers where it is possible to rent a bike, repair it, etc. The project aims to collect all bicycle spots in one place and thus to make Belarus a truly bike-friendly country. "Bicycle" is an interactive map, so it provides the ability to add valuable points to all users. AIESEC established in Belarus. The Committee of the largest student organization in the world after several attempts has finally been registered in Minsk. AIESEC (Association Internationale des Étudiants en Sciences Économiques et Commerciales) has 82,000 members from 131 countries. The main activity is organization of training and youth exchanges abroad, organized by the students themselves. Children's Help Line celebrates its 2nd anniversary. On July 7, Nationwide Children's Help Line 8-801-100-1611 celebrates two years of its activity. For 2 years the line operators have received more than a thousand calls totaling 8,592 minutes. International NGO "Ponimanie" with the support of the Minsk City Executive Committee invites to join the celebration which will be held at the Gorki Children’s Park in Minsk. AD.NAK! ceremony in Minsk. On 27 June the award ceremony of the IV Festival of Belarusian-language advertising took place in Minsk. The event was organised by the campaign "Budzma!" together with online portal Marketing.by and other promotional companies. Among the goals of the Festival is to collect the best marketing and advertising products and pay attention of the professional community to Belarusian language. This year, 314 works by 105 participants were submitted to participate in the Festival’s contest. Men Club in Grodno. The first public discussion and educational club for middle-aged men (30-45 years) launched in Grodno. Members of the Club will have an opportunity to analyze their own life experience, discover their capacity, to expand the circle of friends, and to obtain useful life skills. Club meetings will be held once a week on Saturdays. Sport event for wheelchair users. On 22 June in Minsk, Republican Association of Wheelchair Users conducted a sport event in memory of the legendary Belarusian wheelchair user Nikolai Kolbasko. The agenda included sports, workshops, exhibitions, and individual program for children. The event was aimed to attract wheelchair users to an active lifestyle and physical education, as well as exchange of experience in the integration and rehabilitation of wheelchairs. The Night of Culture with Belarusians. On 5-6 July one of the most important events in Vilnius "The Night of Culture" will be held for the seventh time. This year Belarusian artists and CSOs will take an active part in the open-air event and present seven Belarusian projects in the Old Town of Vilnius. Entrance to all events is free. Coordination of Belarusian projects is implemented by the youth association "StudAlliance".